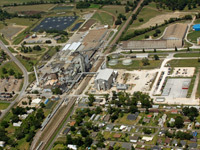 Welcome to Louisiana Sugar Refining, LLC, America’s premier white sugar refinery. Thank you for visiting our website and for your interest in LSR, the nation's most technologically innovative white sugar refinery. Our corporate mission is to bring value to our owners and employees while helping to meet the nation's demand for high quality white sugar products at both the retail and commercial levels. But most importantly, our mission also involves helping to sustain more than 800 Louisiana sugar cane growers by giving them a true economic stake in the industry, thereby doing an important justice to this critical sector of Louisiana's economy. On behalf of all our stakeholders including our employees, owners and community friends and neighbors in St. James Parish, we hope you find this site helpful and encourage you to contact us directly should you have additional questions. Construction began in February 2010, with an 18 month construction timeline. It will take an estimated 600,000 work-hours to complete.